Archive photo by Erin Miller | Galion Inquirer The Galion Lady Tigers Kayley Gimbel advanced out of the Shelby sectionals (held in Lexington due to weather) last Thursday and Saturday. Gimbel will be headed to the district tournament, held at Bowling Green State University. 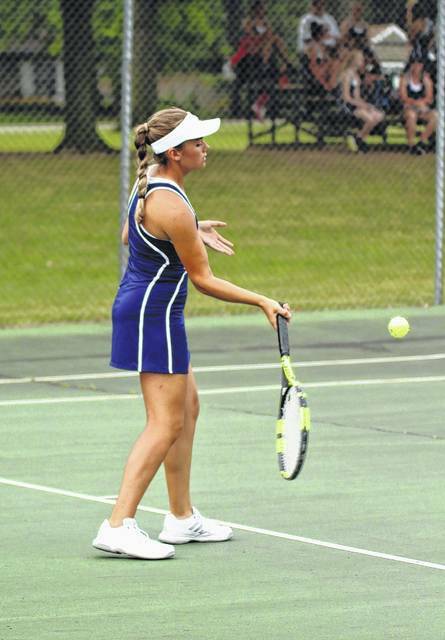 LEXINGTON — After making it past the first day of the sectional tennis tournament last Thursday, the Galion Lady Tigers Kayley Gimbel was back in competition at the Lakewood Racquet Club in Lexington on Saturday morning. Gimbel would play two matches on Saturday to decide her seeding heading into the district tournament, held at Keefe Courts on the campus of Bowling Green State University. In her first contest of the day, Gimbel would defeat eventual three-seed Katie Voltz, a junior from Lexington; 6-2, 6-4. In the sectional championship match, another Lexington opponent awaited Kayley. Sylvia Goldsmith, also a junior at Lex, would defeat Gimbel to claim the sectional title and advance to districts as the one-seed; 6-0, 6-2. With that loss to Goldsmith, Gimbel will be seeded number two from the Shelby sectional when the district tournament begins Wednesday, October 11 at 10 am. Claiming the fourth seed was Mariah Medina, a junior from Edison. Kayley will start her district tourney run against the third seeded singles competitor from the Clyde sectional, senior Serena Bruno of Sandusky Perkins. If you are planning to attend the district tournament, the address for Keefe Courts is: 1610 Stadium Drive in Bowling Green, 43402.
https://www.galioninquirer.com/wp-content/uploads/sites/38/2017/10/web1_Kayley-Gimbel.jpgArchive photo by Erin Miller | Galion Inquirer The Galion Lady Tigers Kayley Gimbel advanced out of the Shelby sectionals (held in Lexington due to weather) last Thursday and Saturday. Gimbel will be headed to the district tournament, held at Bowling Green State University.